I long for the days when I used to be able to run. I remember being in the best shape of my life in my early twenties. I went to the gym religiously and ate really healthy. I loved how strong my body felt and looking great was just an added bonus. Things are different now that I have chronic pain. I can no longer run or ride a bike like I used to. However, I can walk so that is what I am trying to motivate myself more to do now that the nicer Spring weather is here. My doctor says I need to strengthen my legs and my core muscles because weak muscles are contributing to my chronic pelvic pain. If getting out of pain isn’t a strong motivation, then I don’t know what is! I have taken up walking and have discovered some nice paths near my home in the Annapolis Valley in Nova Scotia. It feels great to get outside in fresh air and get my blood moving. I am pushing myself slowly a little each day without overdoing it. And now thanks to Mountain Hardwear, I have the right kind of shirt to wear perfect for this physical activity! 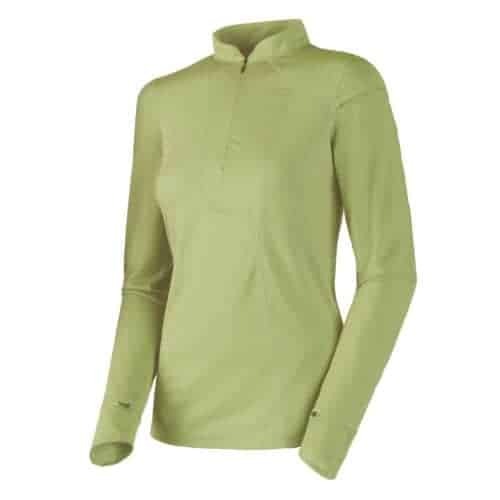 Mountain Hardwear sent me the Women’s Passage Point Long Sleeve T in Pansy to review. It is a lightweight hiking tee with sophisticated detailing . Seams are positioned with your comfort in mind so that if you are wearing a pack, they won’t be directly under it to cause irritation. It also has a small sleeve pocket so you can put your lipbalm or other essentials. The fabric is wicking and fast drying so you won’t look all sweaty after exercising. It has a natural Chitosan antimicrobial finish to control odour because having BO is not attractive or inviting (and downright embarrassing especially if you are working out with a friend). It also has a deep zipper opening at the neck for ventilation. The shirt is loose on me as I wanted it to be. I ordered a Large so it wouldn’t be too tight. It is extremely comfortable and lightweight and is the perfect shirt to wear on the hiking paths. I liked that I didn’t look all sweaty and gross and the shirt did its job keeping me dry and controlling the sweaty smell. I have even been wearing it even when I am not exercising because it is still stylish. I like the versatility of the design. I wore it to my chiropractor appointment and my chiropractor commented on how much she liked the shirt and how good of a brand Mountain Hardwear is. I guess she wears their clothes too! It retails for $60 and is well worth it. The quality is excellent and I would definitely buy more shirts from Mountain Hardwear. Find them online and see what they have to offer. What stores are they sold in? .-= alicia´s last blog ..Friday Flip Offs! =-. This looks like a wonderful product. I live in a mountainous state and like hiking.